Measurement is a very critical aspect of any psychology topic or basically, in all psychology sub- areas. Every psychologist is usually concerned with measuring the children`s intelligence, creativity and also in measuring their moral development. The psychological tests are used to help the clients learn what careers are best for them. This is based on the interests and the abilities of the clients. Similarly, in this course, description of how learning occurred and how learning can be facilitated in the near future. Therefore, psychological testing is the use of psychological tests, which are ideally designed to be an objective and the standardized measure of a sample of behavior (Garber and Simon, 2017). Psychological assessment is the main process of testing that makes use of a combination of techniques to help realize some given hypothesis about a person and their behavior, personality, and capabilities. From the description of psychological assessment, it has been defined as an act of performing a psychological battery on an individual. It is also the process of psychological testing (Garber and Simon, 2017). This research paper will, therefore, address different types of psychological tests, various theories in psychological tests and also a variety of standardized tests of intelligence, personality, achievement, interest, neuropsychology and several other areas of psychological testing as described in the Course description. 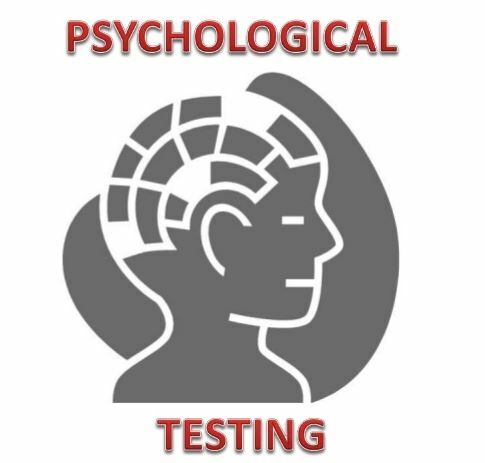 Emphasizes the principles by which psychological tests are conducted is quite important. There are several contradictions when it comes to the use of psychological tests. Psychological tests should be well examined to ensure that, there is valid, appropriate and also the fair use of psychological tests. -It is a measure of a person`s personal attributes- Psychological testing helps the learner to understand an individual`s behavior. Understanding a person`s behavior is quite important since it helps researchers and learners realize/ judge a person based on his/ her way of behaving. It is a way of measuring performance- Individual performance is quite important. People would often need to be assessed how they have performed within a specified period of time. Therefore, in this case, psychological testing would help us realize a persons performance in his or her field of specialty. This is one of the key reasons why psychological testing was devised and should be embraced. Saves time. It is a time-saving means of evaluating an individual`s performance in a certain field. It is, of course, the most economical means of achieving a person`s performance. Similarly, the process of psychological testing is basically scientific. Therefore, testing is expected to have the best results in any experiment. There are basic psychological testing terms that have been explored in this course. As part of the course objectives, it is important to define, describe and also identify these basic testing terms (Garber and Simon, 2017). Such terms include theory, assessment, attitude, personality, measurement, validity, reliability, operational definitions, statistics, average, central tendency, correlation, bias, battery, criterion, decile, standardization, derived score, Level of significance, sample, prediction, randomness, measurement scale, stratification, norms, distracters and factor. As part of this research paper, definitions of some of these terminologies will be analyzed. For instance; -Theory- theory refers to an idea that is used to account for or even justify a psychological situation. Sample- it refers to a set of collected data that is used for psychological testing and analysis. Measurement scale- it is the basis that is basically used for the psychological tests. This research paper also addresses uses and various varieties of the personality tests. The main aim of this is to determine which tool is the best for predicting and also measuring the behavior of an individual/ a person (Rappaport et al, 2017). Establishing the validity of the personality tests is again quite important in psychology. Personality tests are an example of psychological tests that have been handled in this course. It is usually used to measure and also evaluate the behavior of a person in school and several other social places. This test basically identifies differences in personality between persons who are being subjected to the similar test. Personal tests are basically the best psychological tests to use according to a number of psychological researchers. Again in this research paper, the question, “which is a better tool to predict the behavior of an individual, is it the personality test or the projective test?” This is one research problems that have been identified in the course. The research problem can, therefore, be reviewed (Garfinkle and Richardson, 2018). This can be reviewed in terms of whether the personality tests, observation and also the inventories are more reliable and also predictive in determining the behavior of a person. The hypothesis for this research paper is based on using personality inventories and the projective tests and determining which is better in assessing of a person`s behavior. Using research design and the descriptive correlational methodology is the best approach for the researcher. Descriptive psychological tests are therefore tools that are used to measure and predict the behavior of humanity (Garfinkle and Richardson, 2018). However, both personality tests and the projective tests are used to assess the personalities of individuals in different environments, for instance, school and community. Psychological tests can be applied in various instances. For example, organizations worldwide are busy striving to be successful in the best ways possible. Aptitude testing is another form of testing that has been described in the course. It is the second widely used form of psychological test after the personality test. It can interchangeably be used with the term ability. The concept of ability in the aptitude test can be described as a general character of an individual that can ideally facilitate the learning of the various skills. From aptitude definition, it is then easier to state that, psychological tests are basically standardized measures of a small sample of an individual`s behavior (Garfinkle and Richardson, 2018). For instance, a chemist can infer the characteristics of a large compound by only testing a few cubic centimeters of a liquid. Similarly, quality engineers only test a small sample of the finished products and not all of them. The same concept is applied by psychologists in coping with test results. They only base their work on a small sample to come up with results for a larger population. In aptitude testing, there is a need to establish the difference between aptitudes and the abilities. Ability tests are basically given with an option of giving a dire prediction about a person`s future success in his or field of work, mostly occupational activity or even group of activities. However, it’s possible to use the term aptitude in place of the term, ability (Garfinkle and Richardson, 2018). There are several ways of describing aptitude tests. These include being described in the mode in which they are being presented and also be grouped based on their content. Detection of specific behavior- psychological tests are basically used to determine the abilities of a person. Individual differences- Psychological tests are again used to determine the individual differences. This ideally shows the difference in a person`s ability. The person`s performance is also determined through psychological testing (Rappaport et al, 2017). To diagnose by the psychological test- These tests are also used in clinical psychology. This can be used to diagnose mental disorders among individuals. Legal classification- Psychological tests basically help researchers to identify people into different categories. These categories can be normal and abnormal, criminal and innocent, intellectual and mentally disabled and lastly, the able and the disabled. Promoting Self -understanding- this is another function that psychological testing does. It, therefore, provides standardized knowledge about the person`s behavior, aptitudes and also capabilities. Program evaluation- Psychological testing can be used for such measures as program evaluation (Kaplan and Saccuzzo, 2017). Scientific research- psychological researchers use psychological testing for the purpose of research. It, therefore, provides knowledge about the person`s mental level (Chukhraiev, 2017). Military selection- Psychological testing is used during military selection. Chukhraiev, N., Zukow, W., Chukhraieva, E., & Unichenko, A. (2017). Integrative approach to reduction of excess weight. Journal of Physical Education and Sport, 17(2), 563. Garber, B. D., & Simon, R. A. (2017). Individual Adult Psychometric Testing and Child Custody Evaluations: If the Shoe Doesn’t Fit, Don’t Wear It. J. Am. Acad. Matrimonial Law., 30, 325. Garfinkle, M. S., & Richardson, S. L. (2018). Psychological Testing for Psychoanalysis. Psychoanalytic Trends in Theory and Practice: The Second Century of the Talking Cure, 269. Kaplan, R. M., & Saccuzzo, D. P. (2017). Psychological testing: Principles, applications, and issues. Nelson Education. Rappaport, S. R., Gould, J., & Dale, M. D. (2017). Psychological Testing Can Be of Significant Value in Child Custody Evaluations: Don’t Buy the Anti-Testing, Anti-Individual, Pro-Family Systems Woozle. J. Am. Acad. Matrimonial Law., 30, 405. Did you find any useful knowledge relating to psychological testing in this post? What are the key facts that grabbed your attention? Let us know in the comments. Thank you.